OFFICIAL BOOK BLURB: Harmony Black is much more than your average FBI special agent. In addition to being a practicing witch, she’s also an operative for Vigilant Lock, an off-the-books program created to battle occult threats—by any means necessary. Despite her dedication to fighting the monsters threatening society, Harmony has become deeply conflicted about her job. Her last investigation resulted in a pile of dead bodies, and she suspects the wrong people are being punished for it. While on a much-needed vacation, Harmony gets pulled back into action. This time, though, she’s gone from solo work to being part of a team. Their target: the Bogeyman, a vicious and elusive figure…and the creature that destroyed Harmony’s childhood. Surrounded by quirky, fascinating characters as dedicated to one another as they are to their new partner, Harmony must learn to trust her team—and a new romantic interest—on a dangerous and deadly mission that conjures up memories she’d much rather forget. FORMAT/INFO: Harmony Black is 332 pages long divided over forty-five chapters with a chronologically titled prologue, and an afterword. Narration is in the first-person, via Harmony Black solely. This is the first volume of the Harmony Black series and is a spin-off to the Daniel Faust series. 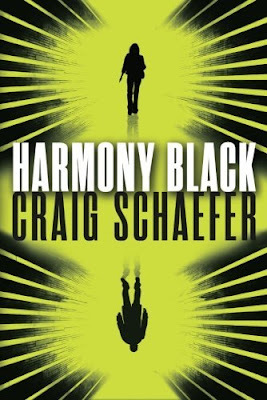 February 1, 2016 marked the North American paperback and e-book publication of Harmony Black and it was published by 47 North (Amazon Publishing). Cover design is by Marc Cohen & David Drummond. OVERVIEW/ANALYSIS: This book is the first book in the Harmony Black series but not the first book where the character is featured in. Harmony was introduced in Redemption Song, the second volume of the Daniel Faust series and since then she has made her presence felt in all the sequels since then. After the events of book 4 (A Plain Dealing Villain), we learn that Harmony has accomplished what she set out to do and hence returns back to her mother's home on the east coast for a well deserved vacation. The story then gives a look into her past from five years ago wherein she was recruited into an organization called Vigilant Lock. Now after the events of A Plain Dealing Villain, she gets pulled onto a special team designated with the call sign "Circus". The team consists of Jessie Temple, Dr. April Cassidy, & Kevin Finn. Harmony makes up the fourth wheel of the team and even though she's the newbie, she manages to fit in properly without upsetting the team dynamics. They are sent to a small town in Michigan called Talbot Cove wherein a few infants/toddlers have been kidnapped and the biggest quandary is that it seems to be the parents who are the culprits. The team however believes that a supernatural entity titled "the bogeyman" is the main cause behind the abductions. The team will also discover that things are not as straight as they appear and while the bogeyman might be their ultimate target. The pathway to their target is laden with many complications and the author conveniently inserts a lot of plot twists that keep this story very, very intriguing. The best part about this book is how the author took a wider perspective of the world than what has been described in the Daniel Faust books. I also loved how the author has inserted several clever and crucial nods to its predecessor series. The author had previously spoken about this while he mentioned why he decided to write more about Harmony. I believe it was to provide a wider window to the world and show all that is encompassed within it. This is very conveniently done via certain names being dropped and characters/situations being mentioned which tie into the Daniel Faust series but for those who haven't read the Daniel Faust series, it will not cause a disconnect with the story. The connections are there but are placed so smoothly that only ardent fans will catch them. Another aspect of this book which was very well done is the horror aspect of the main plotline. So far in the previous books, the author has shown glimpses of it via various scenes or plot twists. But in this book, the author truly outdoes himself by going a route that's rarely taken in urban fantasies. I loved how the author ended the story on a solid but somber note. I also want to stress how much I enjoyed this horror aspect of the plot, even while it rankled me psychologically (being a new father & all). The climax is really something straight out of a Stephen King book and while reading it makes for a thrill ride but if you think about it deeply, you have to admire the author for thinking up such a deeply twisted villain and the location wherein the action occurs. I liked the psychological aspect that the author preys upon and the final twist is really a horrific one but I believe it points to a crucial aspect of the main mythology that the author is hinting at in the Daniel Faust series. This might not be pertinent to many readers but fans of the Daniel Faust series might pick up a thing or two especially after the revelations about the nature of the Paladin in The Castle Doctrine (book 6). The action in this book isn't outrightly present but there are some good sequences here and there and the author does his best to make sure that the readers are lulled into a false calm but then pulls the rug out smoothly. There are some minor characters introduced that were only peripherally mentioned or hinted at previously in the Faust series, who get a solid role in this book. I certainly enjoyed finding out the connections that the author had inserted. Lastly the only thing I would say which could considered a drawback for this book is the fact that the author introduces some intriguing characters however we truly don't get to know much about them. Harmony is in the central focus of the story as is her wont and we also get to learn a few minor but crucial details about Jessie Temple. I was expecting a little more details about the crew but the other two characters April and Kevin aren't really given that much focus and that felt odd. Given that this is the first book in the series, it is something I can overlook but it is a point worth mentioning as the story felt a tad incomplete. CONCLUSION: The self-titled first volume of this series is a dark story that introduces us to a murky world wherein no one knows what is truly right but we have these characters striving to do what's right for the folks who can't fight back. 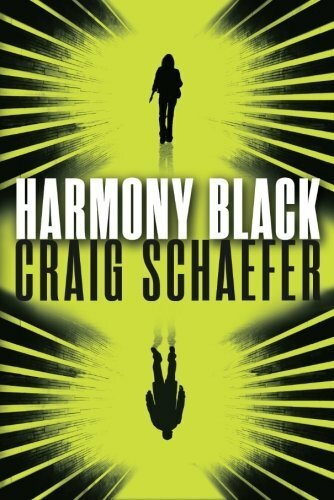 I very much like Harmony's character when it was introduced and after reading this opening salvo, I'm glad that Craig Schaefer decided to write this spinoff series and we get to know more about this fascinating world and mythology that is showcased within from Harmony's perspective.